Trust our specialists and book our wood floor polishing & cleaning services in London. 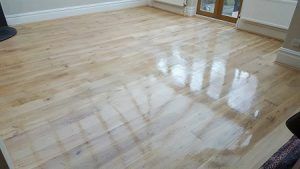 Sometimes wood floors in both domestic and commercial premises in London only need some tender loving care rather than a full floor sanding, repair or renovation. The experts from FK Floor Sanding will perform an assessment of the floor and then take the most appropriate course of action. Varnish, sometimes referred to as lacquer, is a very effective sealant. It makes a floor glow and brings out the warmth of the wood. It is also a very effective protective layer or seal on a floor. Water-based varnish is popular for several reasons. Firstly, it is more eco-friendly. It also doesn’t produce fumes and – an important consideration – it dries faster. On the other hand, oil-based varnishes are thought to last longer than water-based ones. This finish provides a shine similar to the one obtained with wax. As a finish, oil is less durable than varnish but tougher than wax. It can also only be used on a floor that previously had an oil finish. Oil won’t soak in properly if it’s applied to a varnished or oiled floor. The primary disadvantage of using oil is that the floor takes a long time to dry. However, various oils take a different time to dry. For example, teak oil dries faster than linseed oil. This finish brings out the glow and colour of the wood wonderfully. The primary disadvantage with a wax finish is that waxed floors need far more maintenance than oil or varnish finishes. One can use a liquid or wax that is in paste form. Paste is best on previously varnished floors. Liquid wax is less durable as a protective finish. After application of the wax the floor must be buffed with soft pads in order to remove excess wax and bring out the shine. Our experts will discuss the various options in terms of their advantages and drawbacks so that the client can make an informed choice. Whatever type of finish the client selects the experience, knowledge and commitment of all our staff members work to restore and revive tired wood floors so that they are beautiful again. For more information about our wood floor polishing & cleaning in London or to make an appointment call 020 3909 7641.